Ah yes, not quite at the level of Dave Chappelle, but comedic gold nonetheless from my paternal Grandfather Juan (AKA Grandpa Johnny, AKA Johnny Boom-Boom, AKA The Chairman). That comedic gem was on my mind this past weekend when I exhumed the canister for my ice cream maker from the back of my freezer in hopes of creating a recipe for Macapuno Ice Cream. Macapuno is a type of coconut that is grown in the Philippines – the same place where my Grandfather was grown no less. Macapuno is also known as “mutant coconut” because the meat inside of this naturally occurring oddity is more abundant and softer than the meat found in normal coconuts. Despite its unfortunately icky-sounding English name, Macapuno is an incredibly delicious fruit (or is it a nut? Damn you Johnny Boom-Boom!). And here in the states, you can find jarred Macapuno in most any Asian market. The jarred variety is usually labeled something like “Sweet Macapuno Strings” as threads of grated coconut are preserved in some sort of gelatin – think of it as coconut jelly (or jam, depending on how it shakes for you;). Filipinos use Macapuno in a variety of desserts: from cakes, to flan, to Halo-halo. But for me, ice cream is one of the best mediums for this mutant. So ice cream it was this time around at the Burnt Lumpia Worldwide Headquarters. As I’ve mentioned before, I’m an Alton Brown geek. As such, I’ve made a few of his ice cream recipes in the past. 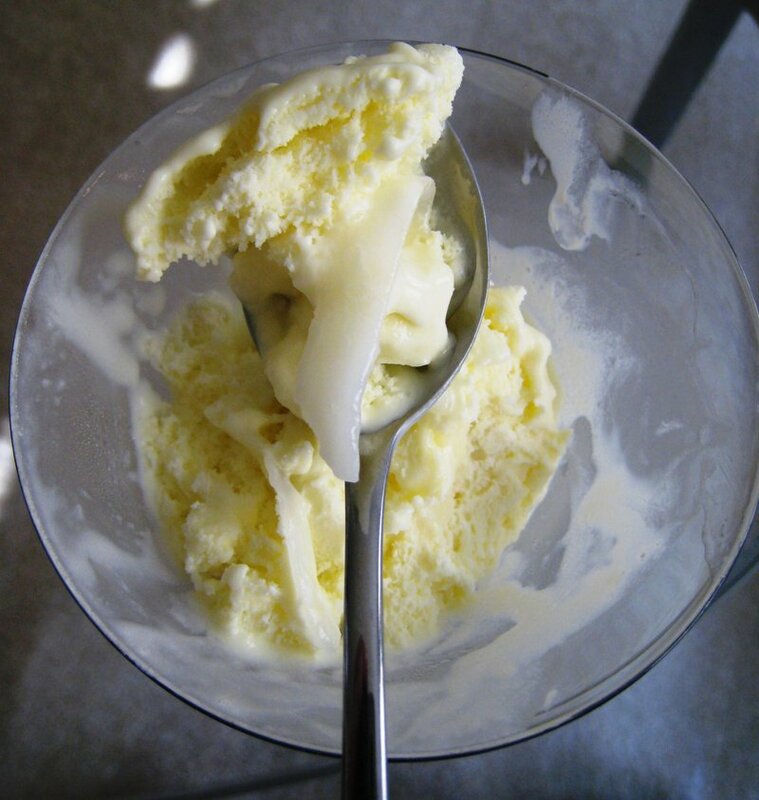 Although AB’s vanilla ice cream recipe is one of the best I’ve tried, I didn’t want to just make vanilla ice cream and top it with Macapuno (although that’s not a bad idea). 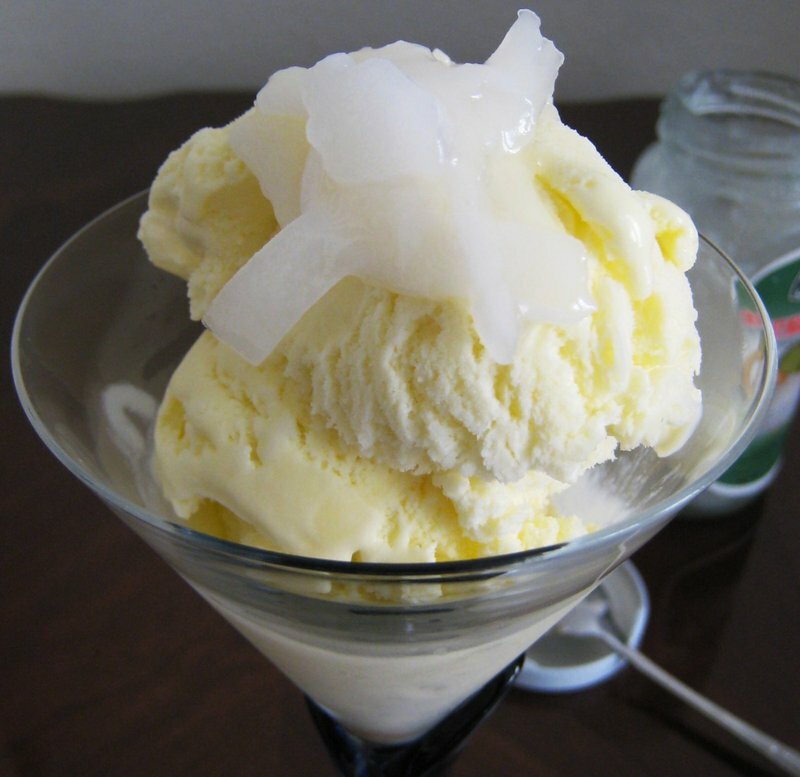 I wanted to make a true coconut ice cream with a definite coconutty flavor. Alton Brown uses a total of 4 cups of liquid (3 cups half and half, 1 cup heavy cream) and 8 egg yolks for his ice cream base. I wanted to keep that same proportion of liquid to yolks because it yields a very creamy texture. However, I used coconut milk in place of some of the half and half and cream. I ended up using a 14-ounce can (14oz =1 ¾ cup) of unsweetened coconut milk, and a cup each of half and half and cream. If you're keeping score at home, that’s only 3 ¾ cups of liquid. Hmmm. What would I use for the final ¼ cup of liquid to reach the magical 4 cups? Coconut rum! Of course! Not only would the rum boost the coconutty goodness I was after, but it would also aid in a creamier texture as alcohol lowers the freezing point of water and inhibits the growth of large ice crystals (small ice crystals, smooth ice cream). I should also note that I actually ended up using only 6 egg yolks (we only had 7 eggs when I made this, and as always, I broke the yolk on the first egg I tried to separate. Egg separating be hard). Anyways, I was very pleased with the resultant ice cream. It was indeed smooth, creamy, and rich. It possessed a definite and pronounced coconut taste as sweet threads of the Macapuno were swirled into the custard made from coconut milk and coconut rum. Place the coconut milk, cream, half and half, and salt in a medium saucepan over medium heat. Stirring occasionally, bring to a bare simmer (just about when it starts to steam and barely bubble) and remove from heat. Add the rum to the milk mixture. In a medium mixing bowl, whisk the egg yolks until they lighten in color. Slowly add the sugar while continuing to whisk the eggs. Whisk until all the sugar is incorporated. Pour the custard through a fine mesh sieve into a large bowl. Add the Macapuno to the custard and mix well. Allow the mixture to sit at room temperature for 15 minutes. Cover and place the mixture in the refrigerator for at least 4 hours, though overnight is better. 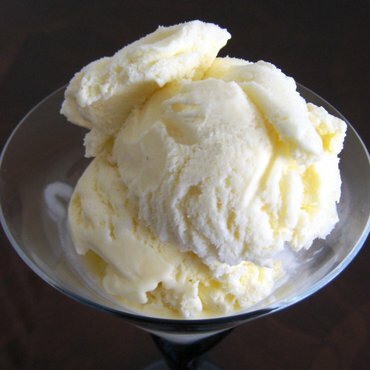 Pour the cold custard mixture into an ice cream maker and process according to the manufacturer’s directions. (Optional) Top ice cream with more Macapuno before serving. Good ol' Grandpa J. I'm pretty sure I heard a different variation where he said,"What's the hardest nut... a coconut!" He also followed that with another classic,"What's the sweetest nut... a doughnut!" I'm not a huge coconut dessert fan, but this sounds yummy -- especially because of the rum! :-P So do you taste the rum in it; is it a bit like Rum Raisin ice cream? Just curious: have you tasted macapuno ice cream in the Phils.? Because I think your version would taste very different. Macapuno is my dad's favorite flavor of ice cream -- so much so that, ever since I can remember, it was as indispensable to have at home as rice. His preferred brand decades ago was Selecta, back when they used carabao milk. Now that they've become more commercial, he buys Arce ice cream(the former owners of Selecta). Jean-Luc, the coconut joke is infinitely funnier when followed by the doughnut joke. Either way, Johnny Boom-Boom is nuts. Katrina, there is a bit of a rum flavor in my ice cream. If you want more of a rum flavor, you can add it to the custard right before it goes into the fridge rather than cooking it with the custard. I have not tasted Macapuno ice cream in the Phils., but I have had it here in the states. The brand was Magnolia, and I think it was a Filipino brand. I wouldn't say my version is very mild, you can definitely tell it is coconut when you taste it. The only macapuno ice cream I've had is at Fosselman's and it was definitely very coconutty. I didn't know it was a type of coconut though, I just figured it was the word coconut in Hawaiian or something. Heh. Learn something new every day. OKAY...I need to whip out my ice cream maker and make this. Oddly enough, the last ice cream I made was also coconut ice cream. Didn't look nearly as good as yours though. Dub C, Macapuno is definitely a Filipino thing, although Hawaii is the stomping grounds of many a Pinoy. And how about 2 dumplings per scoop? Elmo, if you do end up making this ice cream, let me know how it turns out. I hope you like it. This sounds like the next flavour to grace my ice cream maker. Love the Grandpa story too! Brilynn, thanks for the comment. Johnny Boom-Boom is a legend. Rasa, I'm actually in SoCal, so I'll be on the lookout for chive buds at Ranch 99. I googled, "macapuno ice cream recipe," and you have made my day. I was originally intent on mango ice cream due to an abundance of manila mangoes. You have inspired me not only to try your recipe, but later to experiment with ube ice cream, avocado ice cream, and roasted banana ice cream - though not all at once. hahaha. Thank you from NorCal. I found your blog through my search of making ube ice cream. Are you a full-time chef? All the dishes you've made looks so delicious. I'm in the process of trying to make my mom's filipino cooking, but adding a twist of my own that my non-filipino boyfriend and friends can enjoy. Anyway, I just wanted to introduce myself and your blog is very helpful! I can't wait to see what else you experiment with. Hi Jannie! Thanks for stopping by! I am by no means a chef of any sort, but I'm flattered you would think so! I'm just a dude that likes to cook and write. I'm glad you find my blog helpful and I hope you visit often. in this entry, macapuno ice cream is delicious!!!!!!!!!!!!!!!!!!!!!!!!!!!! Can you alter this recipe for a diabetic? I just bought an ice cream maker and I have a couple of diabetic friends who love macapuno and wanted to make this to give to them for Christmas. Thanks! Wow! I'm glad I stumbled into this recipe. I wonder how much of the rum I can taste. My ice cream recipes usually call for some kind of flavoring, what do you think about adding coconut extract? i like macapuno in my fruit salad because the water is absorbed by the macapuno and the salad becomes creamy not watery. And needless to mention... YUMMY! You are so lucky to be able to make macapuno ice cream on your own. Where I live, macapuno ice cream isn't sold anywhere! And we don't have an ice cream maker, so ... meh! I made a blog post about macapuno ice cream, by the way. If I may, I used one of your images in this post. I linked back to this blog post as the source of the image I used in mine.